It is good advice to change batteries in your fire alarms at least once a year. Even our low-power LCD calculators need new batteries from time to time. But at the University of Oxford, they have an electric bell that has been ringing essentially non-stop on one set of batteries for about 178 years! Is the energy crisis solved then? Perhaps not. The bells require a high voltage but very little current and the pair of batteries — piles in the parlance of 1840 — have kept the charge flowing for about 10 billion rings. As you can see in the video below, though, the ringing isn’t very vigorous. How does it work? When you think of converting electrical power to mechanical motion you probably think of a motor, even though there are plenty of other transducers like speakers, muscle wires, and solenoids. 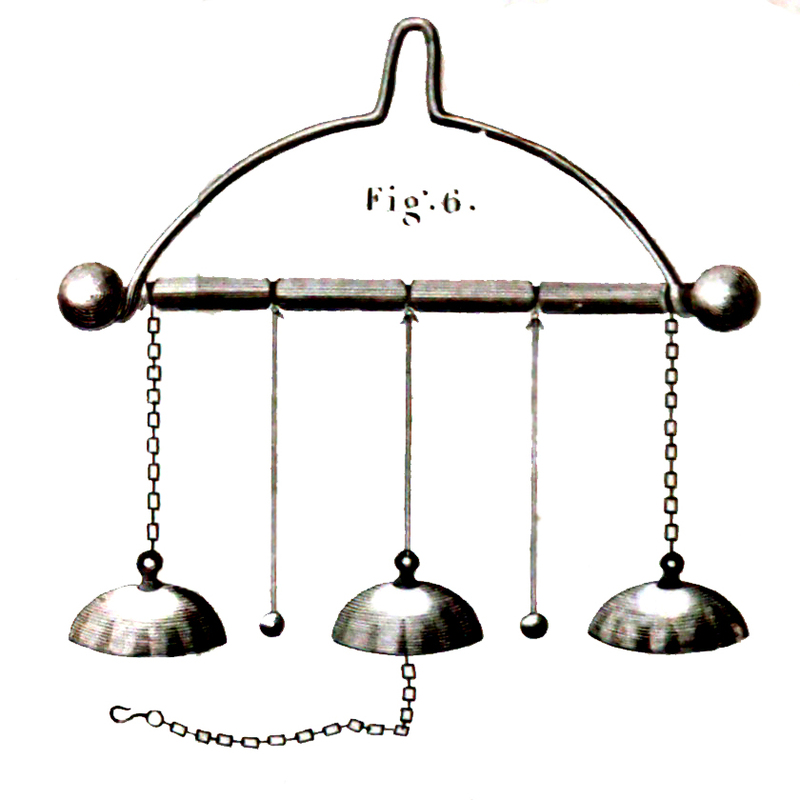 Arguably the first device was electrostatic bells that were invented by a Scot named [Andrew Gordon] around 1742. [Ben Franklin] made them famous, though, so they are often called Franklin bells. The idea is simple: there are three brass bells in a row. The end two hang from a metal chain and the middle one hangs on something non-conductive. In between each pair of bells is a metal “clapper” hanging from a non-conductive thread. A Leyden jar connects between the metal stand and the central bell. This causes the clappers to be attracted to either the center bell or the edge bells. When it strikes the bell it picks up its charge which causes it to be repelled and it transfers its charge to the opposite bell which then repels it again. This whole process repeats as long as there is a fresh charge supplied. The Oxford bells are a little different. They use a pair of dry piles — no one is exactly sure about their construction, but they may be Zamboni piles — a battery dating back to 1812 invented by a priest who appears to have had nothing to do with ice rinks. In fact, [Zamboni] used the same principle to develop an electrostatic clock where the clapper was effectively a metronome-like pendulum. If you’ve ever made a battery with pennies, tin foil, and paper towels soaked in vinegar, the idea is similar. The Zamboni uses a dry electrolyte. Some have speculated that the Oxford bells are a perpetual motion machine, but — of course — it isn’t. The batteries will eventually dry out and the bells will go silent. Actually, they are silent today because you can’t hear their gentle ring behind two sheets of protective glass. Still, it is enough to hold the Guinness World Record for durable battery providing tintinnabulation (and, yeah, we had to look that up). We’ve seen homebrew electrostatic clackers. We’ve also seen at least one modern Franklin bell that used soda cans, a pop top clapper, and a magic wand. A dry pile is somewhat of a misnomer. Since there is some moisture in the atmosphere, a hygroscopic substance such as honey may have been used in the electrolyte to keep the battery damp and the current flowing. Figured honey would degrade over time. The old one found in Giza beg to differ. Ahh the batteries that powered the shredder in the frame …. Ahaha. And it’s worth more now it’s part shredded?! A battery that “powers” a inaudible/silent bell. So are you just trolling or are you really stupid enough not to see the point of this? stupid/trolling or not… Lufo does have a point. The article focuses on the battery (and I can see why, simply due to it’s age and the fact that it is still doing it’s task). But the whole concept of this “bell” still functioning lies in the fact that it is a very energy efficient bell. Or perhaps efficient isn’t the correct word, it just requires a very little amount of energy to operate. Interesting in multiple ways. The last time I saw a Zamboni pile was in some ancient (I would guess about 1940/1950) Infra red viewer, possibly manufactured in eastern Europe, I bought it in a junk shop. Out of curiosity I took it to bits. The piles consisted of a series small carbon coloured discs with some other substance as a backing. These were held in a metal tube, it formed part of some circuitry attached to a small valve ending in a screen – like a TV – and with an infra red lens attached to it. I never got it working and passed it on to someone else to experiment with, so I cant tell you anything more about it. Suffice to say these piles were in use in the middle of the last century. Could have been a photomultiplier tube. Those use high voltage batteries – and without the addition of a lead glass would irradiate your eyes with x-rays. Clearly this is how Banksy powered his shredder. Did Banksy go to Oxford? The bell’s perpetual “power” is doubtless an electeret. The term is a mashup of the words electricity and magnet. It “holds” electric charge just like a permanent magnet “holds” magnetism. This excellent little .pdf tells you electeret history and how to make them yourself. http://electretscientific(dot)com/author/Article3(dot)pdf And, no, it is not a source of power any more than a stationary magnet is. And, no, it is not “run” by atmospheric moisture. The paper explains it all. No trolls or stupidity here, just science! Oh, yes, every cheap electeret microphone has one in its heart “driving” a small FET charge amplifier. The FET is powered by a tiny DC current you must supply to the microphone, but the electeret charge is a permanent feature, just as in magnets.. I don’t know where you get your fire alarms (smoke detectors), but ours have a guaranteed battery life of at least 10 years… I would not trust the life and the life of my family on the cheapest detector made in china to be honest, especially if they are so poorly designed that you have to change the battery every year. Those are powered by regular lithium batteries. Older smoke detectors used alkaline batteries and those lasted a few years at the most. Which is why annual replacement was suggested. There’s also alarm connected to mains and has rechargeable battery for power failure event.